Color(s): White and orange, light brown, fawn, white and gray. Originating in France as a hunter of hare and other small game, the Briquet Griffon Vendeen nearly became extinct after World War II. The breed was restored due to the efforts of French dog show judge Hubert Dezamy. Today, this breed is relatively unkown in their native country and is considered to be rare and difficult to obtain in the United States. The Briquet Griffon Vendeen is well-built, hardy, intense, and bold. This breed is agile, athletic, and is very nimble over rough terrain. Briquet Griffon Vendeen's exhibit an appearance of strength and power. Their most distinctive feature is their coat. 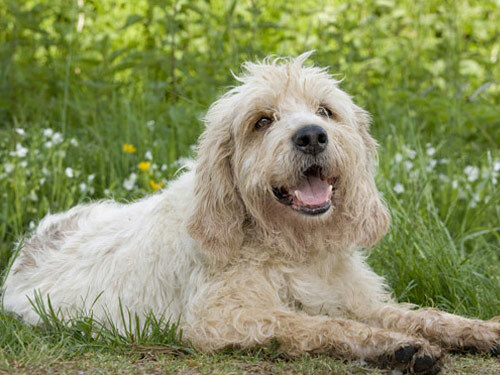 This breed is jovial, fun-loving, and playful. They are also unruly and independent. The Briquet Griffon Vendeen does best in a home with older considerate children. They will typically do well with dogs and other household pets they have been raised with. Briquet Griffon Vendeen's are devoted, hard-working, and dependable. The Briquet Griffon Vendeen breed requires regular combing to prevent matting. Bathing should only be done when necessary. Due to the rarity of this breed there are minimal health issues. There have been low incidences of patella luxation and distichiasis. The Briquet Griffon Vendeen is a double coat breed. The outer coat is long, dense, and wiry. The hair is heavier in the eyebrows and on the muzzle which forms a moustache. The under coat is soft and thick. The Briquet Griffon Vendeen presents a training challenge due to their extreme independent and single-minded nature. They will not respond to harsh or heavy-handed methods. Training must be done with firmness, fairness, patience, and consistency. The Briquet Griffon Vendeen breed is not recommended for city or apartment living. They require an inordinate amount of physical exercise and mental stimulation. The Briquet Griffon Vendeen does best in a rural setting with ample room to roam and hunt.